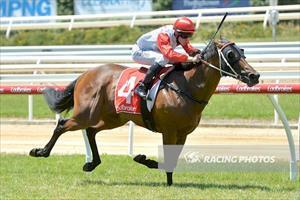 Bolek confirmed the promise of his Maiden win with an impressive victory at Ballarat on Tuesday. The three-year-old son of Smart Missile led most of the way to defeat Indernile by one length in the Class 1 Handicap over 1200m under Jordan Childs and make it two wins from three starts. Jordan Childs said the win was as good as it looked. “I was able to get an unchallenged lead and we had it pretty easy up front,” Childs said. “I stayed off the fence a little bit as I thought the inside might be wearing out a little bit on the circle. “To his credit he found for me late and went right to the line and finished off well. "We've always had a decent opinion of him and that was a good effort," Moroney said. "It's always difficult to win your next start after a maiden and he did that well against some handy opposition. "We'll see how he comes out of this before we make any plans but should be plenty of options for him." Congratulations to connections Kariba Racing, Mr S P O'Donnell and Ballymore Stables (Aust) Pty Ltd.